Researchers Jan Kramers and Georgy Belyanin found mineral compounds unlike anything on Earth, or in known meteorites or comets, in these fragments from the Hypatia stone, which was picked up in south-west Egypt in the Libyan Desert Glass Field. In 2013, researchers announced that a pebble found in south-west Egypt, was definitely not from Earth. By 2015, other research teams had announced that the ‘Hypatia’ stone was not part of any known types of meteorite or comet, based on noble gas and nuclear probe analyses. (The stone was named Hypatia after Hypatia of Alexandria, the first Western woman mathematician and astronomer). The internal structure of the Hypatia pebble is somewhat like a fruitcake that has fallen off a shelf into some flour and cracked on impact, says Prof Jan Kramers, lead researcher of the study published in Geochimica et Cosmochimica Acta on December 28, 2017. “We can think of the badly mixed dough of a fruit cake representing the bulk of the Hypatia pebble, what we called two mixed ‘matrices’ in geology terms. The glace cherries and nuts in the cake represent the mineral grains found in Hypatia ‘inclusions’. And the flour dusting the cracks of the fallen cake represent the ‘secondary materials’ we found in the fractures in Hypatia, which are from Earth,” he says. 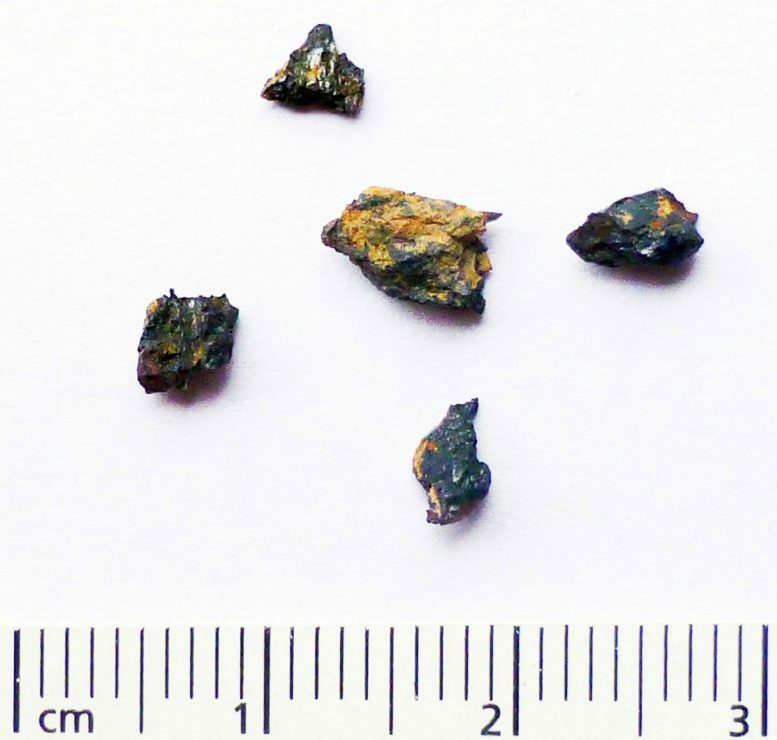 The original extraterrestrial rock that fell to Earth must have been at least several meters in diameter, but disintegrated into small fragments of which the Hypatia stone is one. Straight away, the Hypatia mineral matrix (represented by fruitcake dough), looks nothing like that of any known meteorites, the rocks that fall from space onto Earth every now and then. “Even more unusual, the matrix contains a high amount of very specific carbon compounds, called polyaromatic hydrocarbons, or PAH, a major component of interstellar dust, which existed even before our solar system was formed. Interstellar dust is also found in comets and meteorites that have not been heated up for a prolonged period in their history,” adds Kramers. In another twist, most (but not all) of the PAH in the Hypatia matrix has been transformed into diamonds smaller than one micrometer, which are thought to have been formed in the shock of impact with the Earth’s atmosphere or surface. These diamonds made Hypatia resistant to weathering so that it is preserved for analysis from the time it arrived on Earth. When researcher Georgy Belyanin analyzed the mineral grains in the inclusions in Hypatia, (represented by the nuts and cherries of a fruitcake), a number of most surprising chemical elements showed up. “The aluminum occurs in pure metallic form, on its own, not in a chemical compound with other elements. As a comparison, gold occurs in nuggets, but aluminum never does. This occurrence is extremely rare on Earth and the rest of our solar system, as far as is known in science,” says Belyanin. “We also found silver iodine phosphide and moissanite (silicon carbide) grains, again in highly unexpected forms. The grains are the first documented to be found in situ (as is) without having to first dissolve the surrounding rock with acid,” adds Belyanin. “There are also grains of a compound consisting of mainly nickel and phosphorus, with very little iron; a mineral composition never observed before on Earth or in meteorites,” he adds. Dr Marco Andreoli, a Research Fellow at the School of Geosciences at the University of the Witwatersrand, and a member of the Hypatia research team says, “When Hypatia was first found to be extraterrestrial, it was a sensation, but these latest results are opening up even bigger questions about its origins”. Taken together, the ancient unheated PAH carbon as well as the phosphides, the metallic aluminum, and the moissanite suggest that Hypatia is an assembly of unchanged pre-solar material. That means, matter that existed in space before our Sun, the Earth and the other planets in our solar system were formed. Supporting the pre-solar concept is the weird composition of the nickel-phosphorus-iron grains found in the Hypatia inclusions. These three chemical elements are interesting because they belong to the subset of chemical elements heavier than carbon and nitrogen which form the bulk of all the rocky planets. “In the grains within Hypatia the ratios of these three elements to each other are completely different from that calculated for the planet Earth or measured in known types of meteorites. As such these inclusions are unique within our solar system,” adds Belyanin. “We think the nickel-phosphorus-iron grains formed pre-solar, because they are inside the matrix, and are unlikely to have been modified by shock such as collision with the Earth’s atmosphere or surface, and also because their composition is so alien to our solar system,” he adds. “Was the bulk of Hypatia, the matrix, also formed before our solar system? Probably not, because you need a dense dust cloud like the solar nebula to coagulate large bodies” he says. Generally, science says that our solar system’s planets ultimately formed from a huge, ancient cloud of interstellar dust (the solar nebula) in space. The first part of that process would be much like dust bunnies coagulating in an unswept room. Science also holds that the solar nebula was homogenous, that is, the same kind of dust everywhere. But Hypatia’s chemistry tugs at this view. “For starters, there are no silicate minerals in Hypatia’s matrix, in contrast to chondritic meteorites (and planets like the Earth, Mars and Venus), where silicates are dominant. Then there are the exotic mineral inclusions. If Hypatia itself is not presolar, both features indicate that the solar nebula wasn’t the same kind of dust everywhere – which starts tugging at the generally accepted view of the formation of our solar system,” says Kramers. “What we do know is that Hypatia was formed in a cold environment, probably at temperatures below that of liquid nitrogen on Earth (-196 Celsius). In our solar system it would have been way further out than the asteroid belt between Mars and Jupiter, where most meteorites come from. Comets come mainly from the Kuiper Belt, beyond the orbit of Neptune and about 40 times as far away from the sun as we are. Some come from the Oort Cloud, even further out. We know very little about the chemical compositions of space objects out there. So our next question will dig further into where Hypatia came from,” says Kramers. Be the first to comment on "Hypatia Stone Contains Mineral Compounds Unlike Anything on Earth, Known Meteorites or Comets"